I have decided to join the blogger world! I hope that I can share my painting inspirations and experiences in a new and interesting way. 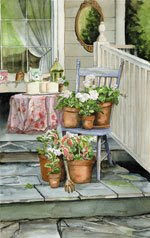 I specialize in Garden Portraits in watercolor. Throughout the spring and summer months I visit gardens and garden tours to shoot photo references, sketch and sometimes paint plein air. Most of my commission work consists of these garden portraits, which are such a pleasure to paint. Not only do I visit beautiful gardens, the home-owners share the many stories of why these gardens and homes are so important to them. I meet some wonderful and interesting people in my travels and I love what I am able to learn, as I am a gardener also! Left, is one of my favorite pieces which I painted in August of 2006. It is called Suzanne's Front Porch. Suzanne Krueger is a friend of mine who has been involved with the Franklin Garden Club for years. The year that her garden was on the garden tour, I took the reference photos for this painting. She has a wonderful sense of design and I just love visiting her garden. It has always been an inspiration to me! One of my favorite parts of this painting was developing the slate walkway and steps. I used 14 or 15 layers of paint to create the little nuances of color and shadows in the stone. I love Suzanne's romantic touch of the pink rose print fabric on the little table.